Mikey Wright (AUS), Quiksilver Pro France wildcard, will also compete in the Red Bull Airborne specialty event. The next call for both events will be on Sunday, October 7. PLAGE DES CULS NUS – Hossegor, Landes, Nouvelle-Aquitaine, France (Friday, October 5, 2018) – The Red Bull Airborne specialty event is called OFF for the day as small conditions continue. Event organizers have also called the competition OFF tomorrow, Saturday, October 6, for the Red Bull Airborne and Quiksilver/Roxy Pro and will reconvene on Sunday, October 7 for the next call. With the Red Bull Airborne window open until October 10, there is still plenty of time left in the waiting period to host the world’s best aerial surfers. The event will feature an 18-man field across six qualifying heats and a Final scored in a leaderboard format. Josh Kerr, former Championship Tour (CT) competitor, is one of the developers of the Red Bull Airborne and the Event Director. Kerr looks forward to running the specialty event and bringing back airshows to the surfing world. 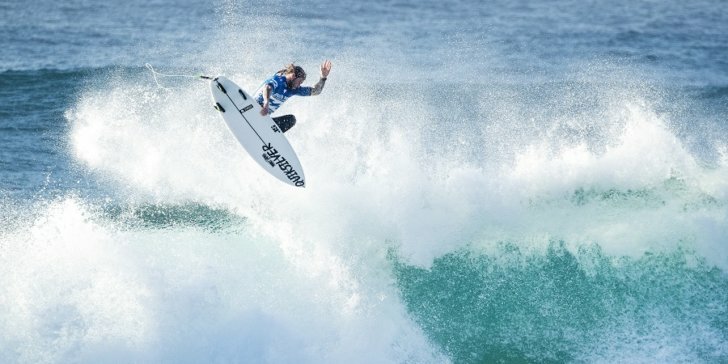 “It is really cool to bring the Red Bull Airborne to the biggest platform in surfing so that the biggest names and everyone can all join together to do exactly what everyone loves to do: big airs,” said Kerr. “I got to grow up in this era of airshows back in the early 2000s and it kind of filtered me into the Championship Tour. I know that there are a good group of guys who aren’t built for the tour and it is just not what you are meant to go to, but this is something different. This is that platform for those kinds of guys to get after it and send it and bring it back. Small/minor surf for most of Friday should bump up slightly on Saturday. Larger surf is expected to build through Sunday, although onshore wind will likely be problematic. Confidence continues to glow that medium size NW swell will move in for the middle of next week (Tue-Thu) with generally light/favorable wind. Larger pulses of swell are possible Friday and Sunday. Surfline. The Quiksilver and Roxy Pro France and the Red Bull Airborne will be broadcast LIVE on WorldSurfLeague.com, the WSL’s Facebook page, and the WSL app. Also, check local listings for coverage from the WSL’s broadcast partners.